The opening of the Osage Railroad Bridge, just east of Jefferson City, will provide huge time savings for freight and passenger rail trips between Kansas City and St. Louis. 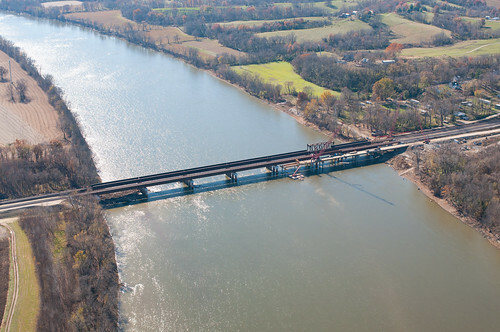 The new 1,200 foot railroad bridge provides 2 main line tracks across the river. The former single-track bridge over the Osage river created service bottlenecks and was the last single-track section along the route. The project, made possible by the American Recovery and Reinvestment Act, was estimated to cost between $24 million- 28 million but in September, was projected to come in $3 million to $4 million under budget. The now completed bridge will open on Monday, November 25, 2013. View photos of the bridge construction on flickr.